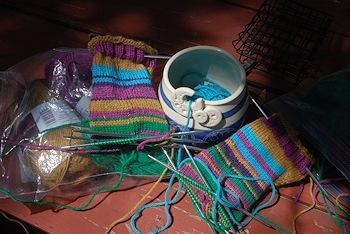 The seventh pair of "Sporty Shorty" socks for summer bike riding aren't finished, but a friend brought me a gorgeous yarn bowl from ArmadilloCon this year (since I still can't drive, I couldn't go) and that's my excuse for photographing the unfinished pair of socks. The name of this pair is Carnival. Although the top of the sock on the right is in shadow, it's exactly like the one on the left--a rolled top in the gold, then ribbing in the deep rose, then more gold before the turquoise stripe. The yarns are, from the top: (1) Ella rae Classic, #135 gold, the "framing" color (top, heel flap. toe) (2) Plymouth Yarns Galway Nep, #541 deep rose, (3) Ella rae Classic Superwash, turquoise (bands long gone, no number), Cascade 220 Superwash handpainted (bands long gone, a rich royal purple heather) Ella rae Classic #90, emerald green. This pair of socks has been difficult; I went too far on #1 before starting #2, then tried to hurry, and that meant #2 has been acting like a Cursed Sock...everything from having to cast repeatedly, trouble joining the circle, ordinary dropped stitches, extra stitches, peculiar stitches (what did I DO? I have no idea), incredible yarn tangles, difficulty with the heel turn (and I don't often have any problem at all with the heel turn), and so on. I have very little turquoise leftover yarn left (I have some balls deep in storage to make another full-size pair of socks) so most of the sock foot is yarns I have more leftovers of--the green and the deep rose. The purple is a suspect sock yarn--the only pairs of socks I made from Cascade 220 Superwash got all limp and stretched out after repeated washings (and it started with the first wash. I didn't put them in the washer but did them by hand, as I do all the socks.) So the purple's being used as an accent yarn, where if it stretches out it'll be constrained by the Ella rae or the Plymouth, neither of which does. Yes, I might try knitting the purple with smaller needles, but the problem with smaller needles has been my eyesight. We'll see what the new glasses (due this week) will do for that. When I finish these, the last short pair for the summer (I need new socks for this winter, and my huge pile of leftover yarn from previous long socks has shrunk from five or six Ziploc bags to two) I plan to lay all the pairs out together and take a picture. Meanwhile, there's a royal blue pair of regular socks stalled in the ribbing because I needed more pairs of the shorties to wear on the bike. Something you might consider looking into is a ball winder (Pictures here) for turning skeins into center-pull balls. Quite handy for knitters! You're right; a ball-winder is helpful. I have one (though I wish it made smaller balls! Those "cakes" are large and ungainly) and I do use it to wind all the yarn that arrives in skeins. The picture here (http://e-moon60.livejournal.com/457698.html) shows the cake my ball-winder makes. Ella rae Classic comes in balls, already center-pull, but as you get down to the last bits, it gets messy. You can see the working end of the gold ball inside the sack to the right of the rightward sack. So did the Plymouth Yarns Galway Nep. If it comes in a ball, I just use the ball the yarn comes in. My mother wound all her yarn by hand, around one of my great-grandmother's old wooden knitting needles (or around a pencil, if I was using the wooden needles) but she had a gift for making tidy, smooth, snug balls, compact as the ones the Ella rae yarn comes in (though hers were spherical, not sort of oblong. I think it's because she was an engineer, but she would probably have said it was just experience.) When I try it with a full 200 yard skein, I get a mess, not a proper ball. Hence the swift and the ball-winder. I occasionally look at yarn and wonder what my friends would like and there are so many different descriptions it is very confusing (to a person who has never knit). I envy your feet and hope that your new socks make you as happy as your older socks. These short socks make me very happy in summer, when the taller ones--except in air conditioning--are a bit (!) warmer than I want. I'm mentioning the yarn brands & color numbers only for knitters who might be interested--I expect to most people it will be a "skup this" moment. You're right; there are WAY too many yarn types for the non-knitter to get hold of--not that I have, myself. My knitting doesn't begin to encompass the whole range of knitting, so I ignore yarns that wouldn't be good for what I want to knit. Yarns come in different weights/gauges--basically, the thickness of the strand, but also for some thicknesses including the way it was spun. And they come made of many different materials: animal hair, spidersilk (the incredible golden spidersilk is possibly the most beautiful fabric I've ever seen), silkworm silk, plant fibers, manmade fibers. It's mind-boggling. Even within the limits of what I want to do now (more socks! more socks!) and the material and gauge I've chosen (wool, worsted weight) there's a lot of stuff to choose from. Nice yarn bowl! Those can be quite handy. I'll be using it this evening when I start knitting. Yes! I think that may be why I was given it. It's by Peri Charlifu, Aegean goods (Aegeangoods@comcast.net) Its style name (I'm guessing from the card tht came with) is "Riversong's Yarn Bowl." I've not seen a yarn bowl before, a fine idea, I do love it when beauty and practicality come together. It sure works better than the actual bowl (from the kitchen) that I tried at one point. Some have a hole in the side, for the yarn to feed through, or a differently shaped slot, but the crescent moon in this one does a fine job of feeding out the live end while keeping the yarn itself from hopping out of the container.